It was the first cold morning of the season, and Kenny Cramer was in hasty conversation with some of his fellow stallholders when I arrived at the market. Once they had concluded their chat, I took the opportunity to speak with Kenny and in the course of my interview discovered that the chilly atmosphere in the market today was for reasons other than meteorological. But first Kenny outlined his family’s involvement in the market over the the last three generations. Usually stallholders speak with pride when they describe how their family history is interwoven with that of the market, yet I discovered a reticence with Kenny which I had not encountered before, so I asked about the next generation. “I’ve got one boy, he’s at college studying IT and computers,” Kenny explained,“But I wouldn’t want him to go into the market. Things are not going to last here.” And he revealed that all the traders had been to a meeting with the council on Tuesday where they were told that within weeks big changes are coming to Columbia Rd Market over which they have no control. “Nobody’s happy. Nobody wants it. None of us has got no say. All of us went to the meeting, but everything has already been decided. 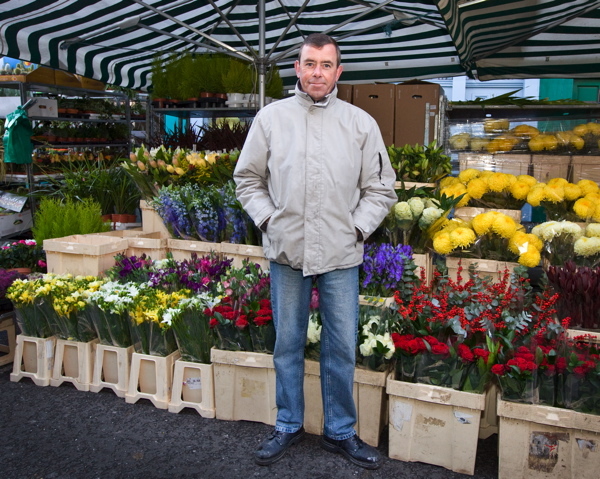 It will be the end of the flower market,” he confided to me, his eyes blazing with withheld emotion. We stood for a moment without speaking in the midst of the market and then I walked round to the front of the stall to talk with Kenny’s father Ron to learn his opinion on this unexpected development. I found the senior Mr Cramer hard at work organising the flowers before the customers arrived, yet although he turned away from his task to greet me when I approached, I discovered the emotion of the situation was such that he could find no words to express his feelings adequately. He stood in dignified silence and looked me in the eye with regret, before returning to the consolation of his work. Alarmed at what I had discovered and realising why the traders were in conference when I arrived, I crossed the road to speak with Carl Grover who was busy wrapping up bunches of Amaryllis for sale later in the morning. He confirmed what I had been told, adding that the market is going to be extended to each end of the street, trolleys will no longer be permitted on the pavements and there is the possibility of other traders being introduced selling different commodities. Most frustratingly, the flowersellers are not being informed yet of the specific nature of the changes thus preventing their objection. “There’s a question mark hanging over the future of the market.” Carl announced with a weary grimace, and a glance over my shoulder to check that his parents Mick & Sylvia Grover the herbsellers were not within earshot. “Show me a long-established market like this where they have made changes for the better. The age of traditional markets is coming to an end.” he added with a shrug. It was apparent from everyone I spoke to this morning that this week’s “consultation” meeting had been used to announce changes which are being decided without the participation of the traders. Over recent weeks, I have been learning of the beauty of the human culture manifest in Columbia Rd Market and the families who have built it up over generations of hard work, turning up in all seasons to provide flowers to the people of the East End, and making a modest living but never a fortune. Unquestionably, these people have earned the moral right to decide the destiny of their flower market and the fate of their respective pitches that sometimes, like Albert Dean, have been in their families for as many as four generations. “Hopefully they will listen to us,” said Carl Grover with a bright grin of fragile optimism. It certainly was a cold morning this morning and reading this does not warm me in the slightest. Why change something when it aint broke? I love Columbia Road – I had no idea it was changing. This news has upset me greatly. What can we do as your readers to help? Is there such a thing as an email petition? I am sure that every one of your readers would sign. These sorts of ill made decisions have got to be stopped. The powers that be are supposed to be helping the public and not making the decisions without their opinions. I thought the new government wanted more local residents etc to be involved in the community decisions? I certainly would sign it. Thank you for all the wonderful stories you tell us. why can’t people leave something amazing alone? I am the accredited Representative of the market, also I am a trader and have been since late 1949. Your interview paints a picture of panic rather than concern, without going in to detail of the mutterings and differences of opinions among the traders. I say there is always a light on the horizon. If there are to be changes within the market it will happen. We will have to get orientated to it. The attendance of the traders at the meeting mentioned was not as stated, there were only about a dozen turned up out of a total of 45 traders. The proposed changes were displayed. The changes proposed are to give the traders more space per pitch By spreading the market by 140 feet easterly. Also primarily to alleviate the thick congestion by Carl Grover’s and Kenny Cramer’s pitch. I know that none of the traders wish to be moved along. I do not wish that for myself. But the politics and requirements between certain traders at the expense of others has brought the proposed changes about. The local residents will be objecting and so will shopkeepers but there is a necessity for the safety of the market and the public in the future. I have kept all of the traders informed of prevailing circumstances in my regular attendance with the Market Services and the other reps of other markets. I find that also other traders in other markets are so resigned to believe they can do nothing about any domestic serious problem. Their attitude of the many is whatever will be will be. I find this in our market also. The traders challenge me on many issues. I reply as best I know how. There are domestic problems within our market that will drive the changes (if any actually materialise) on. Love the blog and this ongoing series. I’ve been going to Columbia Road for many years and love the ‘the thick congestion” it’s really not too bad, its what gives the market its soul. This spreading easterly sounds like the market would turn more into a garden centre with different zones rather than the amazing, vivid experience it is today and has been for over century. Surely by spreading the market this would take away even more parking areas. Why not leave the market alone and get the parking controls changed? I have seen it again and again, change for the ‘better’ has destroyed london market after london market!